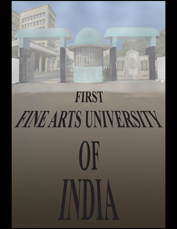 Building upon the foundation of the existing college, the International Institute of Fine Arts (IIFA), is working towards creating India’s first private Fine Arts University, as part of the ‘Universe of Art’ project, to be built on 100 acres of land near Modinagar, NCR Delhi, an area that is already emerging as an important education and cultural hub of the country. This unique Rs.1100 crore project will focus on art, culture and education and will see the construction of the first private fine arts university in India together with a leading performing arts centre and an internationally recognised museum. IIFA is working with Arts for India along with UK-based Prince’s Foundation for Building Community, which is leading on the master plan for the new Arts University. The Prince’s Foundation was established by HRH the Prince of Wales to encourage sustainable development placing community engagement at the heart of its work. The aspect that will set the new Arts University apart will be that everything connected to visual and performing arts will be available within the given area. One form of art inspiring the other! This exceptional creative cluster will further contribute to the cultural and economic renaissance of India with benefits impacting Asia and the world.